Just like with the old commercial jingle that went, "Everybody doesn't like something, but nobody doesn't like Sara Lee," I can pretty confidently substitute "seaplanes" for "Sara Lee." The Grumman Widgeon was one of many iterations of their twin engined amphibious airplanes that is immediately recognizable to most people over the age of 40. In fact, the Widgeon was the seaplane that appeared each week on the 1970s television show "Fantasy Island." It was "Ze plane! Ze plane!" that Tattoo would call out at the beginning of each episode. Authentic plans and data on an all-time modeling favorite. Simple squared-off wings and tail surfaces, flat sided fuselage, in-line engines make for easy construction of a beautiful and stable model. The G-44A Widgeon with two inverted Fairchild Rangers and Sensenich wood props with bullet-nose spinners. 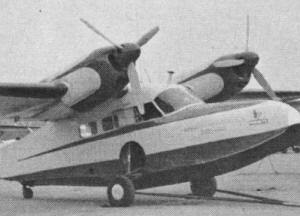 Mother-"Goose" had her first offspring in 1940 when the baby amphibian, model G-44, was hatched. In July of that year the newborn black and yellow prototype, NX28633 made her maiden flight and, of course, mother-goose was quite proud of her. She was christened the "Widgeon" shortly after leaving the nest, spreading her wings and flying straight and true for a 20-minute first flight. Of all-metal construction except for fabric-covered control surfaces and aft portions of the outer wing panels, the aircraft provided unequalled utility and rugged characteristics for its class and category ($30,000 price bracket). Power was supplied by two inverted six-cylinder air cooled Fairchild "Ranger" 6-440C-5 engines, of 200 hp at 2450 rpm (sea level rating). Top speed at optimum altitude was 165 mph and cruising speed 150 mph, somewhat optimistic figures as more pilots reported 150 mph tops and. a reasonable cruising speed of 138 mph. The Widgeon was no slouch in the air; it climbed at 105 mph with 12 degrees flaps; after final approach, with 40 degrees flaps, settled in at 75 mph, touching down around 60/65 mph. There was complete control throughout the speed range; ailerons, rudder and elevators were responsive up to and through a full stall. It could be trimmed to fly hands-off and turned into one dead engine in complete safety with aileron control alone. 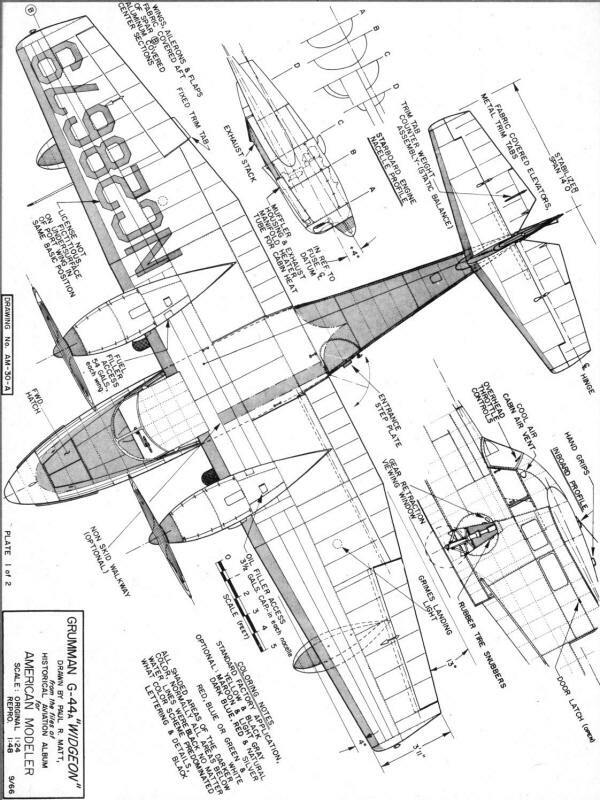 There was never any claim that the Widgeon could hold its altitude on one engine, however, but the safety factors inherent in such a design provided less worry and trouble should one engine be lost. Coast Guard J4F-1 of WW-2 period. Two-tone color scheme: blue plan-view and side surfaces, white on all undersurfaces. Super-Widgeon conversion by McKinnon-Hickman, using Lycoming flat-sixes and three-bladed controllable-pitch props. Excellent flying characteristics is one matter with an aircraft-control on land is another, while water performance is still another. Control on land was easy with no ground looping tendency, visibility was good, brakes and the steerable tail wheel along with the capability of "jockeying" engines provided unexcelled maneuvering. On water there was no porpoising, no problems with cross-wind landings and it operated well from calm seas to two foot swells. It was designed to withstand rougher seas without undue strain but this was not a recommended procedure. The success of the rugged little Widgeon brought immediate orders and within a year of the prototype's first flight, 16 were ordered by private interests. One of the machines was demonstrated to the U.S. Navy and, impressed by the possibilities of such a versatile craft, it ordered eight machines as the J4F-1 for delivery and service with the U.S. Coast Guard. These were delivered in 1941. An additional order followed as war clouds loomed ever closer that year and the Coast Guard took delivery of an additional 17 JF4-1's in 1942. The Widgeon had little chance to prove its ability and usefulness in private hands prior to the United States entry into World War II. By the latter part of 1941, the military services were hard pressed for all types of aircraft. The Navy in particular, long denied sufficient funds to build up an adequate air arm, suddenly found itself in dire need of everything from a top rated front line fighter to utility types and short range search and rescue aircraft. With additional funds available the Navy sought the Widgeon as a valuable asset. During those hectic mid-1940 war years the Grumman Corp. was busy with fighter and torpedo bomber orders but managed to supply 131 Widgeons to the Navy as J4F-2's. The Army Air Corps, given priority during the early war years, impressed what appears to have been all 44 pre-war civil models as their model OA-14's by 1942. In 1944, the Navy released several J4F-2's to the Brazilian Navy where they assumed utility and off-shore patrol duty in much the same manner as those used by the U.S. Navy. An additional 15 J4F-2's were supplied to the Royal Navy for communications duty and were renamed by the British - the "Gosling" I. Majority of the Goslings served in the West Indies during World War II. Assigned off-shore patrol duties and anti-submarine patrol early in the war, the Coast Guard experimented with the use of depth charges on their J4F-1's. America was at war and the Coast Guard didn't particularly care to fly over submarine infested waters without some sort of defensive weapon. Special racks were installed under each wing root, midway between the fuselage and engines. The Widgeons proved adaptable to this new role and still carryall the usual Naval navigation, radio and survival gear, plus pilot, co-pilot and radio operator. Tests were made and a number of trial runs with the bomb laden J4F's but the need for short range anti-submarine bombers, such as several of the Widgeons were converted into, dwindled by 1944 and little opportunity arose to prove their capabilities in this role. Production of military versions of the G-44 was completed in 1945. 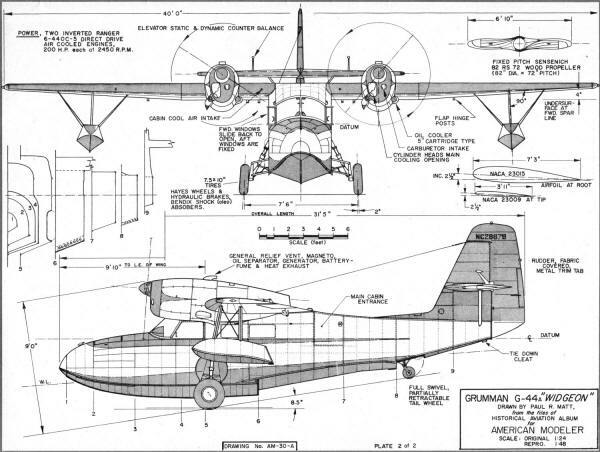 Before the war's end, the Government permitted Grumman to deliver (to certain high-priority firms) an improved civil version model C-44A. Hull was modified, main step moved forward a few inches, a deeper keel-line forward, and an improved breather system employed to enable easier "unsticking" and for better water handling. Customers were found for about 75 post-war Widgeons before manufacturing rights were sold to French Societe de Constructions Aeros-Navales in 1949 to build Widgeons in France as SCAN-30. The French concern made only minor modifications to the airframe, the major change coming with the installation of 200 hp Salmson 8 AS-00 engines. Performance-wise there was little difference or improvement over its predecessors. Some 40 SCAN-30's were built but the European market for the aircraft failed to materialize. Thirty completed airframes were exported back to the United States for further conversions by other independent manufacturers. These machines, less engines, were purchased by several concerns in the United States. 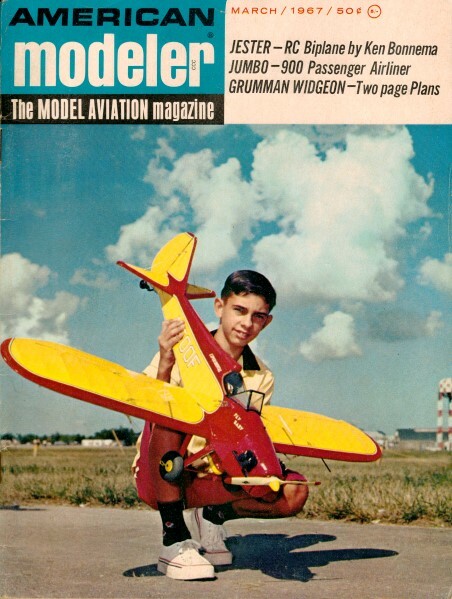 A number of Grumman Widgeons as well as a few SCAN-30's were modernized, converted and in some respects modified to Super Widgeons by the McKinnon-Hickman Co. These models were re-engined with 260 hp Lycoming GO-435A flat-six engines. Overwing exhaust added augmented thrust while new Hartzell three-bladed controllable pitch propellers, of smaller diameter than previously used, gave added performance and prolonged the life of the basic design concept. By late 1954 29 McKinnon-Hickman conversions were sold. "Petulant Porpoise," 12.5 to 1 hull, among tests in cooperation with Navy and NACA. Still the Widgeon refused to fly off into the sunset. Some 15 existing SCAN-30 models were rounded up for another conversion possibility, when in 1959 the Pacific Aircraft Engineering Corp. modified one into a rather impressive but expensive "complete package" version called the PAGE "Gannet". What seemed enormous Lycoming R-680-E3 300 hp radial engines were fitted along with 34 other major refinements to the little Wigeon's airframe. The Gannets were sold as luxury, complete communication/navigation, executive aircraft priced at $89,950 complete. They sported all-metal wings, new wing ribs, six watertight compartments in the hull, instead of the original three, flush riveting, better performance and a greater payload. They were resplendent even to chrome-plated engine cylinders. One of the more interesting projects in which a Widgeon (J4F-2) was involved was its utilization to test increased hydrodynamic and aerodynamic elongated flying boat hulls. The Navy, in cooperation with the NACA, sponsored water and flight tests in which the entire lower hull of the J4F-2 was cut away and various newly designed hulls of high length to beam ratios were tested. The Edo Float Corp. undertook the initial trials at College Point, L.I. shortly after WW II. The purpose was to test proposed hulls for larger flying boats then in the design stages, such as the P5M "Marlin" and P6M "Seamaster". Various hulls could be removed and different ones bolted on. One hull had a length/beam ratio of 12.5 to 1 and was successfully tested in the air and on the water with the Widgeon nicknamed the "Petulant Porpoise." Certainly the Widgeon had a long, varied and interesting life. Once off the drawing board it didn't take long to mature. From the pre-WW II $30,000 G-44 to the $30,600 post-war model G-44A, the basic airframe proved capable of accepting many alterations, conversions and a variety of power plants. Significantly enough even with the latest Gannet version with 600 hp and almost triple its original price tag, the original airframe design and construction remained unaltered except for those changes dictated by the "modern trend". Even to this day, some 26 years after the original Widgeon left her nest, a great many G-44's still push their prognathous snouts through seas and sky all over the world. Here are a couple photos I took of the Grumman G-21 Goose, at the Udvar-Hazy Center of the National Air & Space Museum.